A 7 night guaranteed departure escorted tour visiting Norway’s main cities of Oslo and Bergen as well as the fjords. An ideal holiday for solo travellers from Ireland or those who like to travel with a like-minded group. An English speaking guide from Robinson Scandinavia, our preferred escorted tour travel partner, stays with the group throughout the trip in Norway. We also offer a shorter 5 night version of this escorted group tour. Day 1: Arrive Oslo (D). Transfer from airport to Radisson Blu Plaza. Your tour manager will meet you at 7.45pm (before dinner) in the hotel lobby. Day 2: Oslo – Ulvik (B,L,D). After breakfast you will visit the world famous Viking Ships followed by a beautiful cross country trip by coach to the resort town of Gol for lunch. After lunch cross the wild Hardanger mountain plateau to Fossli, stopping to view the highest waterfall in Norway, Vøringsfoss. Dinner and overnight in a fjord view room in Brakanes Hotel. Day 3: Ulvik – Bergen (B,L). A scenic tour along the beautiful Hardangerfjord arriving in Bergen around midday. In the afternoon take a 2 hour tour of Bergen, including a visit to the UNESCO World Heritage Site of Bryggen Harbour. Ride on the funicular to Mount Fløien for the best views of the city and fjords below. Stay overnight at First Hotel Marin, centrally located next to the old Bryggen Harbour and close to the pedestrian shopping streets. Dinner – own arrangements. Day 4: Bergen – Flåm – Balestrand [B, D]. Coach to Voss where you board a train to Myrdal and experience the amazing Flåm Railway to the fjord side village of Flåm. Then take a 2 hour cruise taking in the Naeroyfjord (the narrowest fjord in Europe, included on UNESCO’s World Heritage List) and the Aurlandsfjord, both branches of the Sognefjord, the longest and deepest fjord in the world. After disembarking in Gudvangen continue to Vangsnes, for the short ferry crossing to the beautiful town of Balestrand. Dinner and overnight in a fjord view room in Hotel Kviknes. 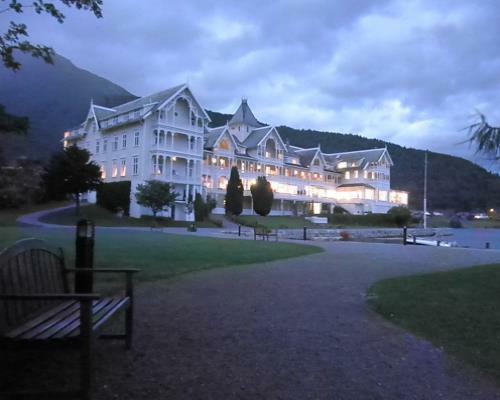 Day 5: Day free in Balestrand [B, D] giving you the opportunity to enjoy the outstanding beauty and nature of the fjords. Day 6: Balestrand – Geiranger [B, L, D]. 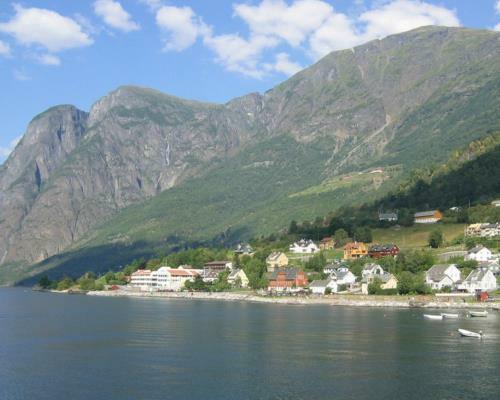 Depart from the hotel by ferry along the scenic northern side of Sognefjord to Sogndal. Continue by road to Fjærland passing under the Jostedal Glacier, the largest in Europe and a stop at the famous Briksdal Glacier. The journey up to the glacier will be made in open cars to give you the best views. After lunch join a ferry for a one hour cruise into the UNESCO World Heritage listed Geirangerfjord. During the cruise you will pass close by some magnificent waterfalls, such as the Bridal Veil and the Seven Sisters. Dinner and accommodation at the excellent Union Hotel. Day 7: Geiranger – Oslo [B, L, D]. Travel cross country from the fjords via the village of Lom with its 14th century stave church and the town of Lillehammer to the capital city, Oslo. Overnight at Radisson Blu Plaza. Day 8: [B]. Depart Oslo. Additional information on printed version of itinerary. (* option to add Stockholm and extend tour to 9 nights on these dates). 6 nights half-board accommodation, 1 night B&B. 4 x lunches on days 2, 3, 6 & 7. Visit to Oslo’s Viking Ships. Guided tour of Bergen including a ride on the funicular. Bergen & Flåm Railways (Voss-Myrdal-Flåm) trip. Approx 2 hour cruise on the Aurlands and Naerøy fjords and 1 hour cruise on the Geirangerfjord. All visits as described in itinerary & all ferry crossings. English speaking tour guide throughout. Transfers to/from Oslo Gardermoen Airport (if arriving/departing on the first/last day of the tour. Flight schedules/availability from Ireland may necessitate extra nights in Norway before/after your tour in which case transfers and any extra hotel nights will be added to the cost). Additional nights in Norway before / after tour dates. Extend tour via coach for 2 nights in Stockholm at Clarion Hotel Sign plus a 4 hour city tour for €495 pp. Single supplement €167. Only offered on dates above marked with *. Prices correct at time of print (Sep 2018). E&OE. Subject to availability and exchange rate at time of booking.